The EQS Group is a listed company with around 300 employees in ten countries. We combine statutory requirements, reporting requirements and information requirements of the various stakeholders with the digital world. This has made us a strong partner for our customers and a pioneer of digital investor relations. The EQS Group solutions are based on a broad range of innovative products and services. In doing so, we pursue a comprehensive, integrated approach. These products and services can be used individually - but combined, they lead to an automation of the processes and thus maximize the benefit for users. We would now like to be your contact for questions about the LEI and, in addition, a Global Legal Entity Identifier Foundation recognized distributor. The EQS Group has registered for the accreditation procedure and will be examined in the following year as to whether it is suitable to be a distributor. An authorized organization is called the Local Operating Unit (LOU) and acts as the primary interface to the LEI holders. They provide registration, renewal and other services and may award LEIs to legal entities in the countries for which they have been accredited. In the first phase, an accreditation plan must be drawn up by the organization that would like to become a distributor. This plan sets out the reasons for the LOU's role as a distributor and the extent to which the company's objectives and capabilities fit into the operational environment of the GLEIF. 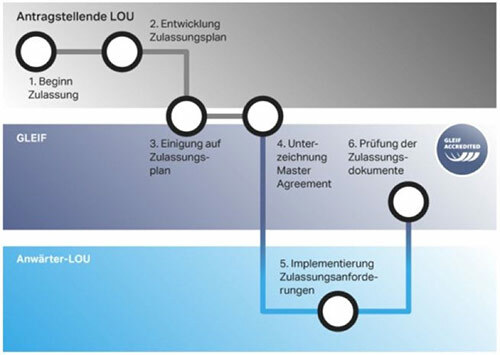 After approval of the accreditation plan by the GLEIF, the LOU requesting the application must sign the Master Agreement. The Master Agreement includes a number of GLEIF regulations and guidelines, which must officially be accepted by the candidate in writing. This makes it an official LOU candidate and the second phase of the accreditation process is initiated. The second phase consists of submitting the accreditation documents to be found in the Accreditation Checklist of the GLEIF. These include company contact details, financial documents and general information on the activities of the organization. These documents will then be examined by the GLEIF and an answer will be given within a period of three months. If the application is successfully approved, the LOU candidate may offer the LEI service from this date. However, if the examination result of the GLEIF is negative, the Master Agreement is terminated and the service may not be offered. GLEIF can also validate applications for the time being, but still request some changes within the organization before final confirmation is given and the LEI service may be offered. We, the EQS Group, are very confident that we will be able to proceed as soon as possible and to be your competent partner for questions about the LEI and an associated agency within next year.